China is building a second aircraft carrier - but this time made entirely from domestic technology, its defence ministry has announced. The 50,000-tonne vessel is being built in the port of Dalian. It will not be nuclear powered, the ministry says. China is expanding its navy amid rising tension with its neighbours in the East and South China Seas. China's first aircraft carrier, the Liaoning, is a second-hand Soviet ship built more than 25 years ago. It was commissioned in 2012 after extensive refits. "This [latest] aircraft carrier is being developed according to entirely domestic designs," defence ministry spokesman Yang Yujun told a news briefing. "The design and construction of the second aircraft absorbed the useful experience of research and training from the Liaoning. "This led to many areas of improvements and enhancements," he said, without providing details. Correspondents say that official confirmation of the construction work comes after months of rumours from military officials. It also comes as China steadily adds to its fleet of cutting-edge frigates, destroyers and nuclear submarines. Increased Chinese defence expenditure in recent years has caused concern among its neighbours and the US, which is making a foreign policy "pivot" towards Asia. Does anybody still need aircraft carriers? It will transport China's J-15 aircraft along with other planes, Mr Yang said. He would not say when the second carrier would enter service, saying much depended on progress in the design process. Chinese naval experts say tensions in the South China Sea have made a second carrier particularly necessary. China claims nearly all the South China Sea, which is reputed to have huge deposits of oil and gas. An estimated $5tn (£3.4tn) in ship-borne trade passes every year. Brunei, Malaysia, the Philippines, Taiwan and Vietnam all have claims to the area. Reactions on social media in China to news of the construction were overwhelming positive and nationalistic. The country's Communist leaders are spending billions modernising their armed forces so they can project military power far beyond China's borders. 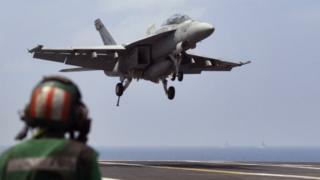 But China does not yet have a fleet of aircraft or pilots ready for carrier operations. So the Liaoning is being used to test and train them, a task that experts say will probably take several years.